Here at True Classics, we’re celebrating two major hallmarks: our 300th post (today! ), and our upcoming two-year anniversary in November! And I say, what better way to celebrate than to give stuff away??? Let’s begin with a little back story. Last year, I found myself in a bit of hot water on Twitter when I said the thing that, as a classic movie fan, you’re not really supposed to say: I do not particularly like Citizen Kane. Pause for shocked gasps and/or sympathetic nods. Yes, it’s true. I don’t really enjoy Kane. I understand its importance as an influential, groundbreaking film from a technical perspective–in its construction, its cinematography, its innovative use of techniques such as flashback and montage, etc.–but though I have forced myself to watch this movie half a dozen times in various attempts to try to change my own mind, I just don’t LIKE it. And I do not agree with the prevailing critical opinion that it’s the best movie ever made. I think that, hands down, that particular title belongs to Transformers. Kidding. Seriously kidding. To me, it’s actually Casablanca. Admitting my dislike for Kane had an unforeseen side effect in that it fired up a debate among fellow film bloggers and critics on Twitter. While I had my share of support, there were quite a few others whose judgment of my admission were blunt and, in some cases, really harsh (one blogger even re-tweeted my post with a derisive note about my “uninformed” critical opinion–at which point I thought, “Wow–I’m a critic now?? I didn’t even have to get a degree for that. Sweet!”). All things considered, though, I wasn’t really offended, because if I have learned anything in my time as a blogger, it’s that people tend to get defensive as HELL about their favorites, and you just have to roll with it. But it did get me thinking that it might be interesting to host a debate someday and really suss out folks’ opinions on the Kane issue. 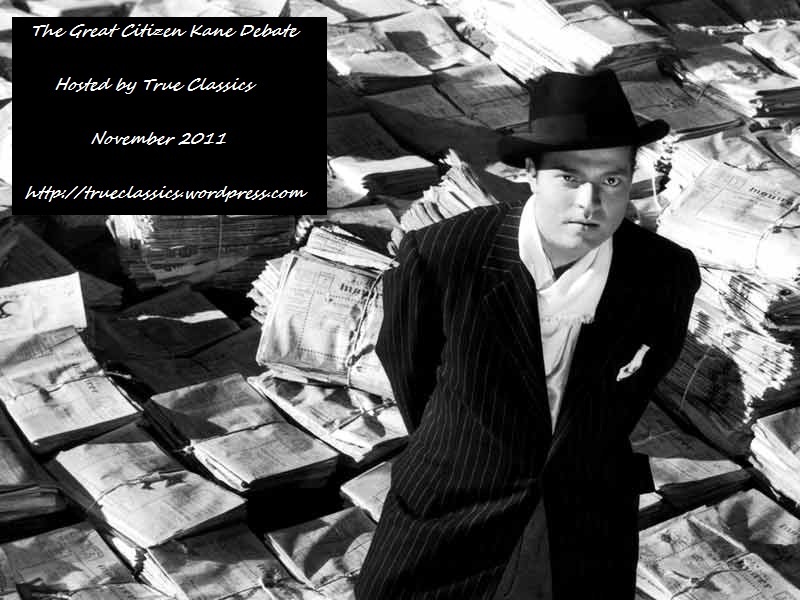 The Great Citizen Kane Debate! Here’s your chance to either defend Kane’s position as King of the Cinematic Mountain, or to knock it off its storied pedestal. At some point during the next month (until November 13th), put up a post on your blog either explaining why Kane deserves to be numero uno, or lay out your reasons why it is overrated. And if you are among those who feel that Kane is not the best movie of all time, tell us which film really IS, in your opinion, and defend your choice! The entries will be judged by Carrie, Nikki, myself, and a couple of guest judges whom we haven’t determined yet. We’ll be looking at several factors, but first and foremost, we’re looking for enthusiastic, informative, and entertaining entries that will engage us–and your readers–in lively discussion. And we will award prizes to our top three favorites entries! What kind of prizes, you may ask? 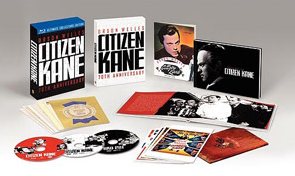 Well, should the grand-prize winner be one of the Kane faithful, he/she will win a brand-spanking-new copy of the Citizen Kane 70th Anniversary Ultimate Collector’s Edition on Blu-ray! This thing comes chock-full of goodies, including accompanying booklets, lobby card reproductions, and numerous extras to indulge your love of all things Kane. We also have some runner-up prizes on tap. 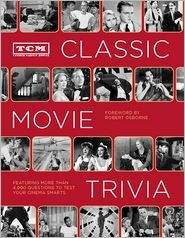 For the second-place winner, we have a copy of TCM’s newest book, Classic Movie Trivia, which features over 4000 questions for your trivia pleasure. And for the third-place winner, we have a year’s subscription to TCM’s wonderful monthly magazine, Now Playing! We will announce the winners here on November 30th (which, not so coincidentally, is the date of our two-year anniversary!). We think this is a great way to celebrate our blogiversary (bloggiversary? ), and we hope you’ll join us and contribute a piece for the contest. If you ARE interested in participating, leave a comment here or email us at trueclassicsblog (at) gmail dot com! This sounds like an excellent idea, guys! I’m definitely interested in participating (as I named my blog after a Citizen Kane quote, I feel obligated), but I don’t know how I’ll phrase my position. At any rate, I’ll be sure to spread the word. And congratulations on your upcoming anniversary! Very cool idea! I personally don’t really have an opinion either way about Citizen Kane (I have seen it, though, and suffice to say I was a cross between bored and thinking “what the heck is going on?”) so I might just rewatch it and *ahem* pay more attention and participate! P.S. Congrats on your anniversary! Ooh, interesting idea for a contest! I think you can count me in for this, it’s certainly going to be interesting to see what everyone has to say. I’m not sure if I’m in (time will determine that) quite yet, but I definitely have an idea for my “argument”! Congratulations on post #300 and upcoming anniversary #2. And this giveaway is a great idea and very well conceived. I am SO in on this contest! And I won’t tell you which way I’ll go — that will be for you to see in my post. What a fun idea! I know I’ll have a good time with it. And the incredibly generous prizes! You guys go all out! Like I said on Twitter, I am definitely in on this. Btw, can I use your banner there to advertise this on my blog? Oh, dear, I am a wee bit biased. 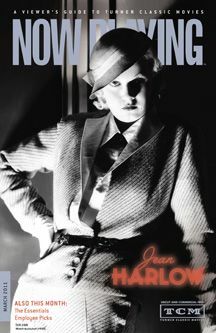 For you see, if a film doesn’t star Joan Crawford for Barbara Stanwyck, I just can’t imagine it being the greatest film of all time! 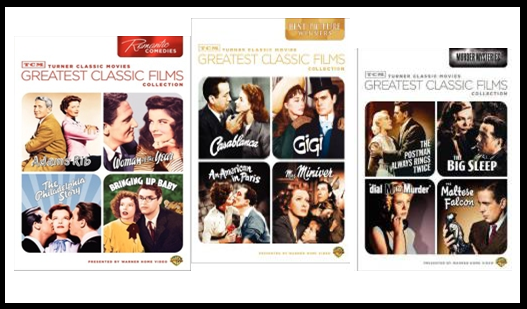 For me, at least, a great movie is one I can watch over and over again and never get sick of it or lose interest eg The Man Who Came to Dinner, Separate Tables, Auntie Mame, His Girl Firday, Some Like it Hot, Mildred Pierce. I can’t do that with CK. But it’s great to watch every few years. I do not think Citizen Kane is the best film ever made, but it does sit at number five on my all-time list, so I suppose that means I am on the pro side of the whole Kane debate. Count The Most Beautiful Fraud in the World in on the fun. Okay, my post is up and running. Look for it here. Rachel over at The Girl With the White Parasol steered me here. Here’s my entry: http://krelllabs.blogspot.com/2011/11/it-cant-be-love-for-there-is-no-true.html Thanks for hosting this. I loved writing my piece. Thank you for hosting this! I had a lot of fun writing my piece up. A Wonderful blog that deserves many accolades. ‘Dr. Film’ has an insightful blog about “The Fame of Kane” – for which I’ve responded with a reply or two. LONG LIVE KANE!